Was sich im letzten Jahr so alles ereignete, können Sie dem Bericht unseres 1. Vorsitzenden, Robert Tonks, anlässlich der Jahreshauptversammlung 2011 entnehmen. Thursday, 13 January 2011, was our first get-together this year and we had a better-late-than-never seeing in the New Year with everyone. Because it is never too late to sing Auld Lang Syne we did. The following quote was read out on the subject of debt from the satirical magazine Private Eye to kick off the new year. It rings as true at the end of the year as it did at the beginning: Prime Minister: "The main thing to concentrate on is debt". The drama group at Duisburg University DUET presented their new play on 1, 2, 3 and 4 February: Terry Pratchett and Stephen Brigg’s CARPE JUGULUM (= Seize the throat!). On 1 February we were invited to an early morning session with breakfast at Haus der Unternehmer at which St George's school presented their work. On 3 February we had our 50th regular meeting. Arranged by Europa Union Duisburg-Niederrhein, members from various international societies met at Central Library on 25 February 2011 in order to get to know each other and exchange views and ideas for possible joint activities. At Volkshochschule on 3 March Rob Tonks presented a selection of his photos and sketches which demonstrate how and why English German advertising is quirky. At our 10 March meeting we had an insight into Duisburg’s future with the aid of a presentation in English of the municipal project “Duisburg 2027”. Project manager, Arne Lorz, demonstrated how citizens and various municipal departments are being involved to produce a new land use plan. 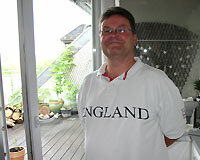 Arne, an urban planner, has lived, studied and worked in Australia and USA. The resulting discussion showed how much our members are interested in the future of our city. To mark the Royal Wedding on 29 April 2011 we, more precisely and especially, Alison and Iris, cooked English breakfast and invited WDR TV. Bob and Lily Clark invited them, Alison and Des Jarvis back to their pad for the afternoon. The clip was broadcast that evening. On 5 May 2011 municipal archaeologist Dr. Kai Thomas Platz gave us a guided tour of the remnants of Duisburg's imperial palace. He pointed out the new poster boards in German and English, the English version having been donated by Deutsch-Britische Gesellschaft Duisburg. "Europe celebrates. Let's celebrate Europe!" Such is the motto of a musical evening we organised in partnership with French, Italian, Croation friends, as well as Europa Union Duisburg Niederrhein and Verein Gegen Vergessen for the third time this year on 6 May. It was a fantastic evening in the very special ambience of Paulus Kirche, Duisburg-Hochfeld. Delicious food and drink from various European countries were provided. We had our 54th regular meeting on 7 July 2011. Scouser Neil Deane, lecturer at the University Duisburg-Essen, came along and told us all about his home town, illustrated by photographs portraying his very own personal view of Liverpool. Neil went into the history of how Liverpool grew, declined and only in recent decades consolidated itself, marked by becoming Europe’s cultural capital in 2008. During his fascinating talk comparisons of Liverpool, the port on the Mersey, with the Ruhr delta and the heritage of the towns and cities in our region - and especially with Duisburg - became evident. Finally, Neil gave us a taste of his book to be published soon "Rocky Passages" in which he describes how listening to rock music has impacted on his life. At our 4 August meeting, Wolfgang Schwarzer, head of Romanic languages at Duisburg Volkshochschule and President of German-French Society Duisburg, told us all about "The French Connection", i.e. the impact of Anglo-Saxon culture on French culture and vice-versa. His fascinating talk focused on the history of this special relationship and also on Paris, literature, music and film. Fitting musical interludes made for a both informative and entertaining evening. On 2 September, the Deutsch-Französische Gesellschaft Duisburg invited the partner organisations Deutsch-Italienische Gesellschaft, Pro Duisburg, Societät and the Deutsch-Britische Gesellschaft Duisburg to a bbq evening they called "Heure de l'apéro" at the "Societät" on Mülheimer Strasse. Having enjoyed an excellent evening of wining and dining, music and stimulating conversation we all agreed a repeat is a must. At this year's Last Night at the Proms on 10 September we were the largest group, i.e. the one from Duisburg, comprising fifty in all, including two guests from New Zealand. London Calling - Radio Duisburg broadcast a live radio interview from the capital with our very own Mr Jarvis during the London riots in September. At our meeting at Babasu on 13 October Rob Tonks presented his book "It is not all English what shines", just published in September. 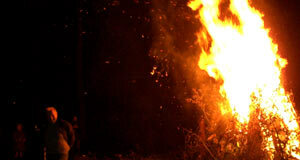 This year we had our annual Guy Fawkes Bonfire Night a week later than planned on 10 Novemberdue to the autumn holidays. The Guy, made as always by Des was more authentic than ever. At Duisburg Central Library, on 6 December, Robert Tonks presented his book "It is not all English what shines – English makes German Werbung funny!" to an audience of 150 paying guests. In his brief introduction municipal library director Dr. Jan-Pieter Barbian revealed that Rob is forfeiting the fee and that the evening’s takings are being donated to the library foundation in the frame of the Duisburg book patronage programme. The money will be spent on new books to the benefit of the department for young people’s and children’s inter-cultural literature. We finished the year on 8 Decemberwith our annual general meeting followed by an Xmas get-together.